That's a great case for him and a unique gift too! Is the inside lined? Or, does the back side of the vynal have a lining of sorts? Great job! Happy birthday to your husband! I love it. The monogram is beautiful. Have a nice day Saturday and wish him Happy Birthday from me. 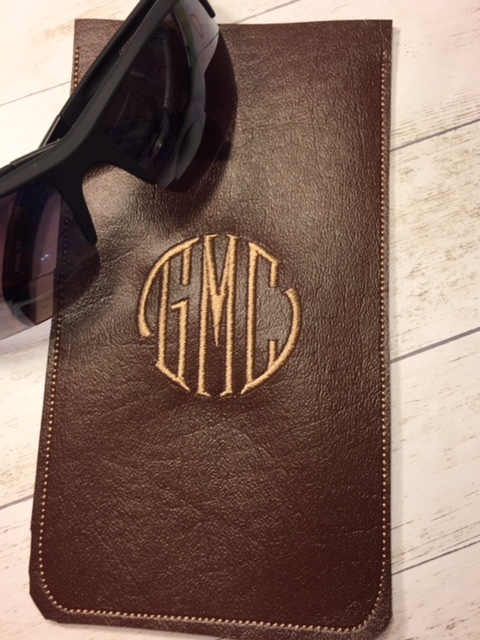 I purchased the monogram font ages ago. I hope it is masculine enough. I will relay your birthday wishes to my dear hubby! Thanks Martine! Better than store bought. Nice Christmas presents for others? You did a great job. I admire anyone that can digitize. think it is a perfect design for a mans glasses. I had to digi my own stuff the other day as well. It looks great, simple yet effective. Good for you!! Thanks bunches!! !